Black and white negative of Frank Roberts. Frank Roberts was born at Paris, ON on 11 February 1882. He joined the Bell Telephone Company at Woodstock in 1900. Roberts came to Whitby in 1917. He retired in 1940 and was made a life member of the Bell Telephone Pioneers. Roberts was a member of St. Andrew's Presbyterian Church. He died at Whitby on 8 March 1972 and is buried in Mount Lawn Cemetery, Whitby. 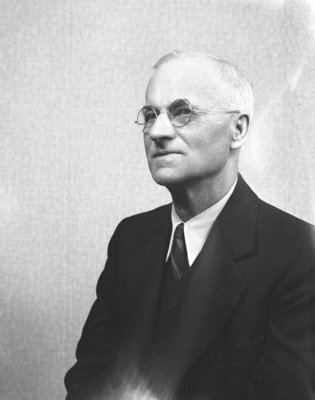 Frank Roberts, c.1940, Marjorie Ruddy, Whitby Archives, 31-009-535.